Aspectus anteriores et dorsales maris locos oculorum monstrat (tabula Anglice signata). Campus oculorum unius Salticidae (tabula Anglice signata). Salticida Asilidá praedatoriá maiore quam se vescitur, quae eandem araneam comesa sit, si potuisset. Celata generis 'Menemeri Salticida formicam marem tenet. Phidippi clari mas et femina coniunguntur. Salticidae, plus quam 500 genera descripta et circa 5000 specierum descriptarum, sunt maxima aranearum familia, cui sunt circa 13 centesimas omnium familiae specierum. Salticidis est optimus inter invertebrata visus, quo ad petendum, venandum, navigandum utuntur. Plurimae species, quamquam placate lentiusque movere solent, agilissime salire possunt, praesertim venantes, sed etiam minis respondentes. Eorum pulmones codicum? et apparatus trachealis bene evoluti sunt, et ambobus systematibus per respirationem bimodalem utuntur. Eorum exemplare oculorum ad summam agnoscuntur: omnibus Salticidis sunt quaterna oculorum paria, quorum oculi anteriores mediani sunt maximi. Monophylia familiae Salticidarum per explicationes phylogeneticis et morphologicis bene probata est. Consensus autem caret quod spectat ad quos alios aranearum greges familia Salticidarum artissime coniungi possit. Inter greges sorores subiectos sunt Oxyopidae, Thomisidae, Clubionoidae, et araneae quae telas aedificant. Salticidae in tres stirpes digeri possunt: subfamiliam Lyssomaninarum, subfamiliam Spartaeinarum), et cladum Salticoidorum sine gradu, quorum Salticoida sunt plus quam 90 centesimae omnium specierum Salticidarum. Salticoida amplius in multos greges digeri potest, inter quos Amycoida, Astioida, Aelurilloida, Euophryinae, Heliophaninae, Marpissoida, et Plexippoida. Salticida in sucino Baltico curata. Perpauca Salticidarum fossilia iam inventa sunt. Omnia in sucino Aevi Caenozoici inveniuntur. Fossilia veterrima ex sucino Baltico inveniuntur, ex Eocaeno, abhinc annorum, a 54 ad 42 milliones. Alia Salticidarum fossilia in sucino Chiapas? et sucino Dominicano inventa sunt. ↑ 1.0 1.1 Hill, David Edwin (7 Octobris 2009). "Salticidae of the Antarctic land bridge". Peckhamia . ↑ Maddison, Wayne P.; Melissa R. Bodner, et Karen M. Needham (6 Octobris 2008). "Salticid spider phylogeny revisited, with the discovery of a large Australasian clade (Araneae: Salticidae)". Zootaxa 1893: 49–64 . ↑ Peng, Xian-Jin; I-Min Tso, Shu-Qiang Li (2002). "Five New and Four Newly Recorded Species of Jumping Spiders from Taiwan (Araneae: Salticidae)". Zoological Studies 41 (1): 1–12 . Vasilevsky, M. 2012. A Classical Taxonomic Guide to Identifying Fifty Unique North American Jumping Spiders. Kaston, B. J. 1953. How to Know the Spiders. Dubuque, Iowa. Crompton, J. 1954. The Life of the Spider. Mentor. Forster, L. M. 1982. Vision and prey-catching strategies in jumping spiders. American Scientist 70:165-175. Jackson, R. R. 1982. The behavior of communicating in jumping spiders (Salticidae). In Spider Communication Mechanisms and Ecological Significance, ed. P. Witt et J. Rovner, 213-247. Princetoniae Novae Caesareae. Peaslee, A. G., et G. Wilson. 1989. Spectral sensitivity in jumping spiders (Araneae, Salticidae). Journal of Comparative Physiology A 164:359-363. Richman, D. B., et R. R. Jackson. 1992. A review of the ethology of jumping spiders (Araneae, Salticidae). Bulletin of the British Arachnological Society 9:33-37. Jackman, John A. 1997. A Field Guide to Spiders & Scorpions of Texas. Houstoniae Texiae: Gulf Publishing Company. Nakamura, T., et S. Yamashita. 2000. Learning and discrimination of colored papers in jumping spiders (Araneae, Salticidae). Journal of Comparative Physiology A 186:897-201. Elias, D. O., A. C. Mason, W. P. Maddison, et R. R. Hoy. 2003. Seismic signals in a courting male jumping spider (Araneae: Salticidae). Journal of Experimental Biology 206:4029-4039. Lim, M. L. M., et D. Li. 2005. 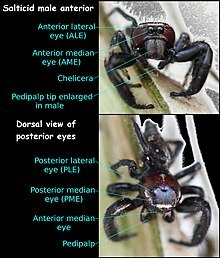 Extreme ultraviolet sexual dimorphism in jumping spiders (Araneae: Salticidae). Biological Journal of the Linnean Society 89:397-406. doi 10.1111/j.1095-8312.2006.00704.x. Richman, D. B., G. B. Edwards, et B. Cutler. 2005. Salticidae. In Spiders of North America: an identification manual, ed. D. Ubick, P. Paquin, P. E. Cushing, et V. Roth, 205–216. American Arachnological Society. Vicimedia Communia plura habent quae ad Salticidas spectant. Novissima mutatio die 16 Septembris 2017 hora 15:53 facta.